Rain. Time Trial. GNB Sports. Hello. The race of truth. An hour of pain and oxygen debt. Everyone is out on the course. The Yellow Jersey just started. Here is the current status of everyone: Bradley Wiggins (COF), the Olympic pursuit champion, has the current fastest time at 1.08:48. Vinokourov is 1:19 faster than Wiggins' time at the third check and has been getting faster at every check. Kloden is in third at the first check and may end up in Yellow tonight the way he's riding. Everyone is slipping and sliding all over the road. Even the motorbikes are slipping. Hincapie is back in sixth and still riding. The other big story of the last 24 hours is current Yellow Jersey holder Michael Rasmussen is charged by an ex-mountain biker with doping. Full Tour de France and doping coverage at VeloNews. GNB Sports will run a feature on doping and how it fits in our culture on the second Tour rest day, Tuesday, July 24. Alexandre Vinokourov is in at 1.06:34. What an enormous victory. Over two minutes on Wiggins! No one will even come close to Vino's time today. CRASH! Kloden has fallen on the same descent where so many riders have crashed already. He has his chain back on and is back riding but this will cost him 15-20 seconds at least. What a shame. Vinokourov was so careful as he went down this hill; even though it cost him seconds he made certain to stay upright. Andreas Kloden riding hard but perhaps a touch slower since his fall. He may still end the day in Yellow but now it is much less certain. Evans is riding well. He also has a chance of ending the day in Yellow. Ligget and Sherwin are amazing calling this on live television. Simply no one better. If you are not watching the daily live television broadcasts you're missing out. The rain falls steadily and so do the racers. It's tricky out today. Kloden continues to tear up the course coming up on the fourth checkpoint. He seems recovered from his earlier crash. Kloden comes in second best time at the fourth check. Yes! The only person positioned to come up on his time might be Cadel Evans. The motorbikes are not allowed to pass the riders on the road or even to come up alongside them least the riders get any help from the motorbike's draft. Levi Leipheimer comes to the finish line with a so-so time of 1.09:13. 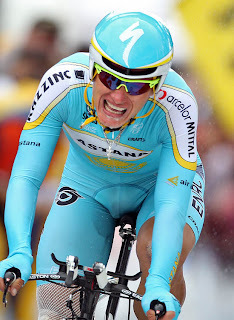 This may give him fifth, sixth place in the time trial compared to the other riders in contention for Yellow. Remember what counts is the comparison of the leaders to the leaders. Here comes Kloden to the line at 1.08:13 in second place making it team Astana in First-Second-Third so far; Vinokourov, Kloden, and Andrey Kashechkin. Rasmussen with his history of doing poorly in time trials is doing quite well, proving yet again that Yellow gives one the strength of two. He continues to hold his Yellow Jersey over Evans but the race isn't done yet. Evans takes second place with a ride of 1.07:48. Rasmussen is riding the best time trial of his life racing Evans and his own demons to hold on to the Yellow Jersey. He may well do it. If he finishes with 1.10:30 or better he stays in Yellow. Mark! Rasmussen has not lost any time to Cadel between the second and third time marks. Unbelievable. The Yellow Jersey is passing the rider who started three-minutes ahead of him on course as if he is standing still. Rasmussen is a man riding his heart out. Michael Rasmussen is going to keep his Yellow Jersey... what a time trial, what a ride! 1:09:29 across the line; Rasmussen leads the Tour de France tonight by one minute. Tremendous riding today by Alexandre Vinokourov, Cadel Evans and Michael Rasmussen the man who can't time trial but with the Yellow Jersey on his shoulders showed the world he's more than simply a climber. Vinokourov didn't abandon when he was in agony earlier in the tour; now he's a stage winner having ridden back into serious contention. Cadel Evans is precisely one minute behind the overall lead. Michael Rasmussen stays in Yellow when last year he lost six minutes in the TT. Levi Leipheimer moves up from seventh to fifth overall. And Vinokourov is back on the Leader board in ninth place just 5:10 back. Surely he can make that up in the mountains ahead? Stage 14 LIVE in the U.S. on Versus: Early Start: Sunday, July 22, 8:00 - 11:30 AM ET/5:00 - 8:30 AM PT. 2. Cadel Evans (AUS) PRL at 1'14"
3. Andreas Kloden (GER) AST at 1'39"
4. Andrey Kashechkin (KAZ) AST at 1'44"
5. Bradley Wiggins (GBR) COF at 2'14"
6. Yaroslav Popovych (UKR) DSC at 2'16"
7. Alberto Contador (ESP) DSC at 2'18"
8. Sylvain Chavanel (FRA) COF at 2'38"
9. Levi Leipheimer (USA) DSC at 2'39"
10. Mikel Astarloza (ESP) EUS at 2'42"